Click here to purchase the software at the Precision Software Store! Click on the images and follow the links to learn more about the Precision Software Modules . All modules share the same databases. unit or as a companion unit to other modules. Discounts on these 5 module purchases! Discounts on multiple module purchases! 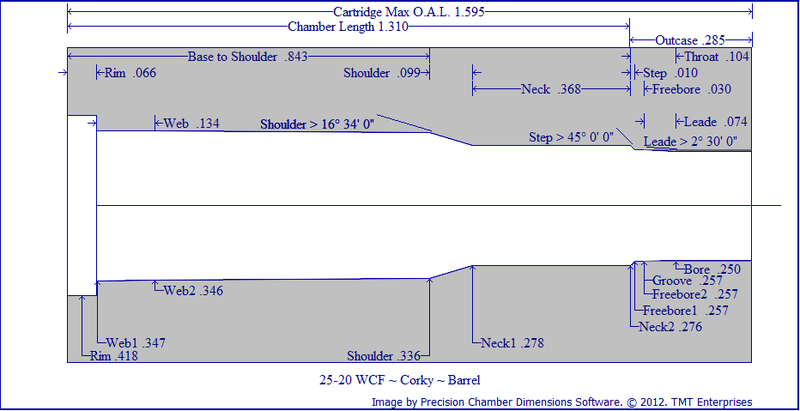 containing chamber and cartridge dimensions. 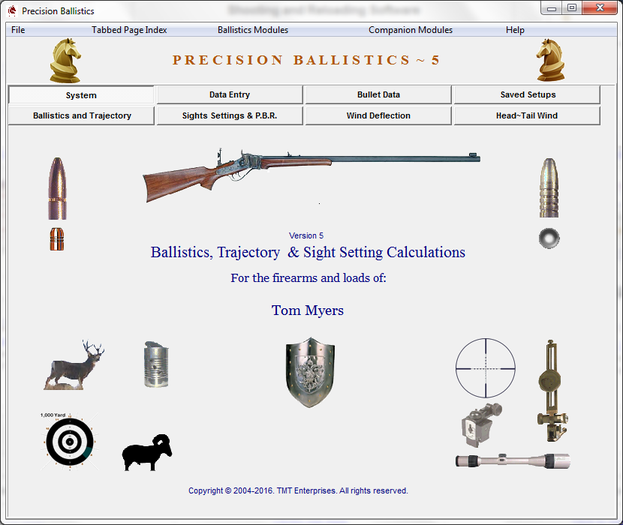 Precision Ballistics may be installed as a companion module of Precision Load Records Software and provides performance evaluation assistance using highly accurate numerical integration algorithms to calculate ballistics and trajectory charts and tables, New features include wind vector value calculations and charts of head-wind, tail-wind and side-wind deflection values. Using individual firearm sight configurations that can be retrieved from a firearm database, the software calculates the bullet path and sight settings at any range for adjustable sights, vernier sights and telescopic sights. Trajectory comparison graphs and charts are used to evaluate different firearm, load and bullet combinations. Hard copy printouts may be produced for all calculations, data and charts. 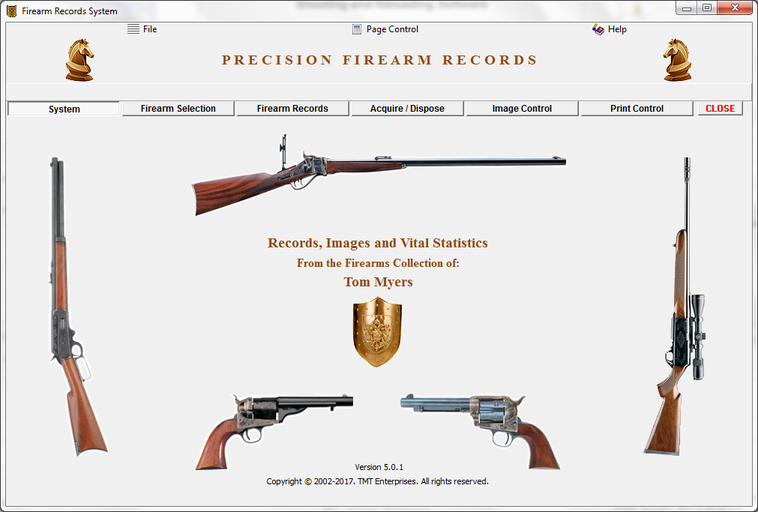 The Precision Records and Load Development system may be installed as a companion of Precision Ballistics and is designed to provide a Firearm and Load Record system for shooters and ammunition reloaders of all types of sporting firearms. Essential record keeping and analysis tools are provided to develop the unique loads required for the maximum accuracy that is inherent in both old and contemporary calibers. 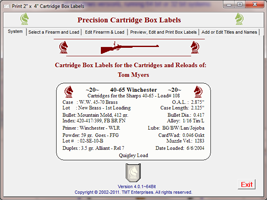 This software is designed to function with modern firearms, contemporary cartridges with smokeless powders, period and replica firearms using black powder cartridges and muzzle loading firearms using blackpowder and black powder substitutes. 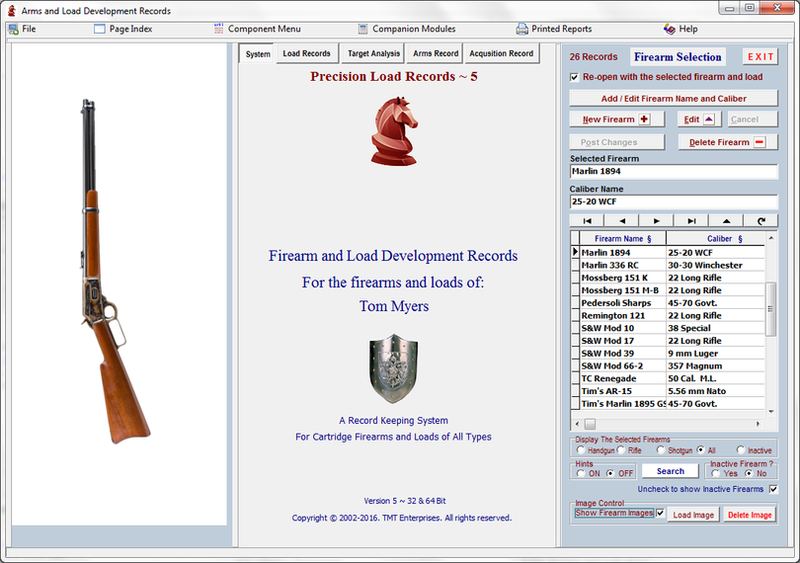 The Firearm Records Module may be installed either as a companion to Precision Ballistics and Load Records or as an independent stand-alone installation. 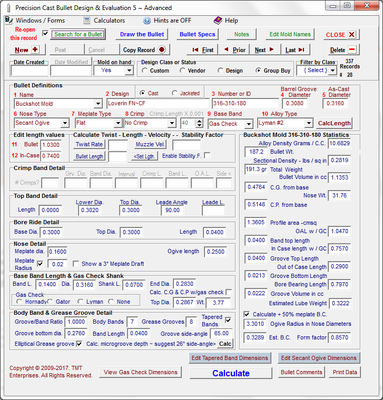 This module will generate a complete 8 1/2" x 11" report on your firearm collection, displaying pertinent information, with cost and disposal values totaled and compiled. Excellent for insurance purposes. The module will also print individula firearm record sheets, detailing all vital information and comments relating to the firearm. 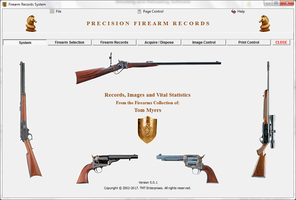 Information related to a specific firearm may be collected and stored by topics that are individualy indexed for easy retreival. The information may be printed either as a collection or as individual topics. A digital camera and it's imaging software are all that is needed to record high quality images of your complete firearm collection. The installation may also be used as a stand-alone, firearm-specific load record database module if the Precision Ballistics and Records package is not installed. When used as a stand-alone installation, the system is an excellent method of recording and retreiving firearm-specific loads . This module is capable of accessing load information recorded for individual firearms and then printing the load data on plain 8.5" x 11" pape marked off as 2"x 4" labels, either or on Avery, #8163, adhesive-backed, peel-off, stick-on labels. 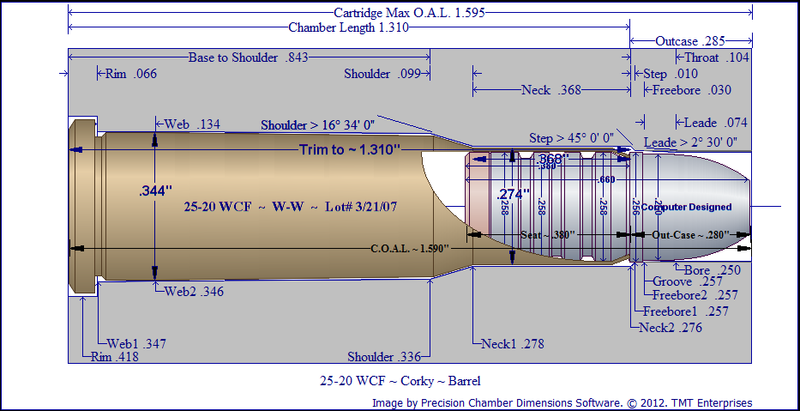 A Ballistic Coefficient Estimator module that will access and modify the Cast Bullet and Jacketed Bullet databases of Precision Ballistics and Records. The Cast Bullet Design software version 5 is now available for purchase and download. Or the images must be photographed or drawn seperately and may then be stored in the bullet databases The images are for reference purposes only, and are not required to calculate a Ballistic Coefficient. All mold vital statistics may be entered, stored and retreived with the extra capability of storing a digital image of the mold and and image of the bullet cast from the mold. Context sensitive help files are available for all aspects of the program by clicking the keybord F1 button. A complete list of all your molds may be printed on an 8.5" x 11" sheet of plain paper. A single page may be printed for each mold displaying the images and comments stored for the mold. A Jpeg Image of a dimensional sketch of the bullet may be stored and viewed. Note - this module does not produce the bullet images. This software is now available for purchase and download. Calculate Cerrosafe Expansion factor with an algorithm that really works.. Create custom alloys and mix or blend alloys with calculated Specific Graity and estimated Brinell Hardness Number. 1. 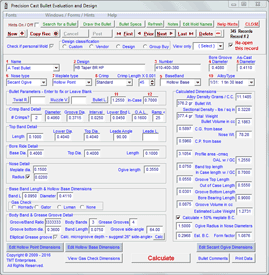 Design, draw, sketch and store the dimensions of cast bullets that work best in YOUR firearms. 2. Accurately calculates cast bullet volume and weight determined by the casting alloy used. 3. 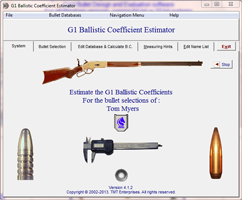 Calculates the bullet sectional density and estimates the ballistic coefficient determined by the bullet profile. 4. 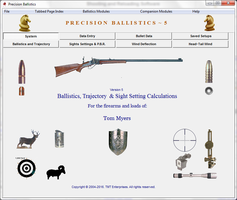 Calculate optimum twist rate, bullet length or muzzle velocity. 5. Calculates lube groove volume and lube weight. 6. Determines the precise center of mass and center of pressure of the cast bullet. 7. 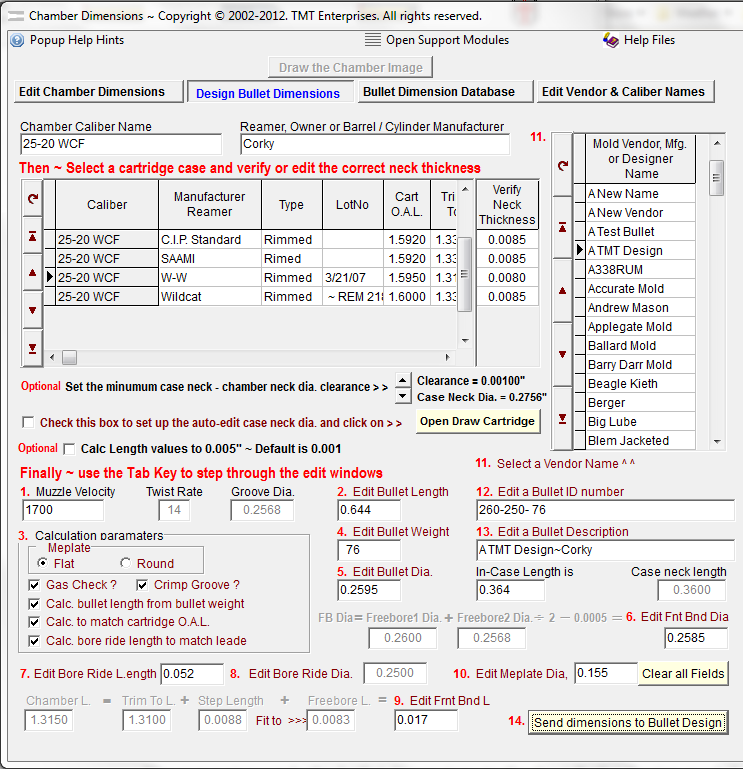 Determines the proper gas check shank diameter based upon caliber and a database of gas check dimensions. 8. 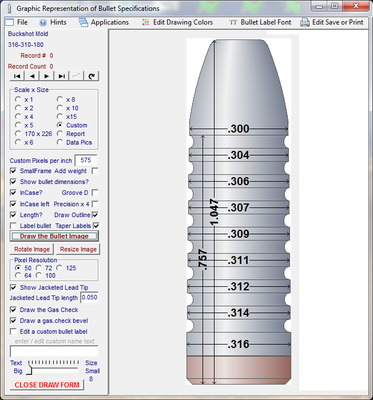 Instantly creates a dimensionally accurate, resizeable, annotated scale drawing of any bullet in the database. The image may be printed or saved as either a bitmap or jpeg file for subsequent printing or forwarding to a mold manufacturer. 9. 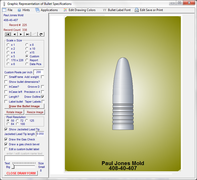 Create a dimensionally accurate, resizeable, images of the bullet that may either be printed or saved to a file for subsequent printing or exportation to other software. Calculate and store multiple band diamters. 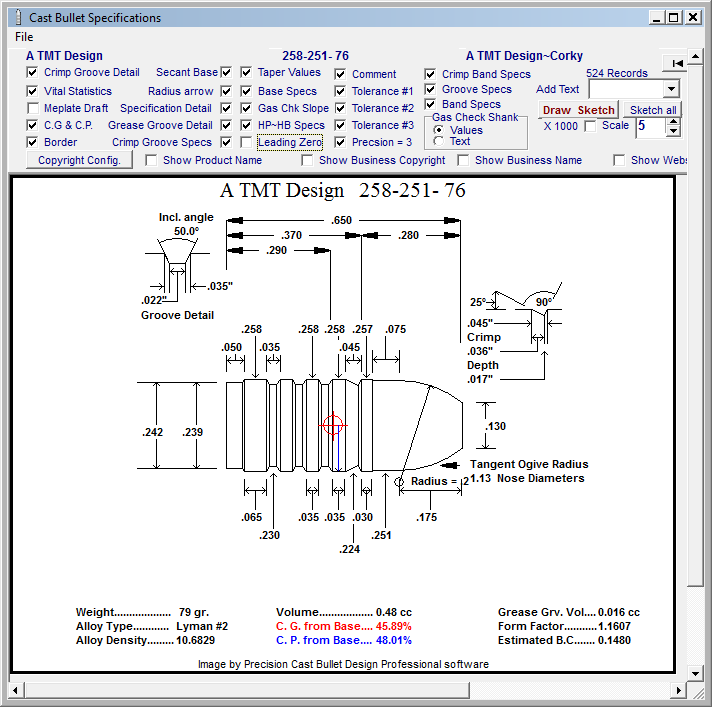 Calculate mold cavity dimensions using mold expansion coefficient and alloy contraction coefficients. Calculate optimum ogive radius, ogive length and standard ball end mill diameter tip configuration. Computer asisted band and grease groove width dimensions. 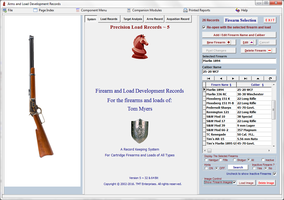 Improved database search function with stored images of each bullet record. Many added sketch configuration options. Control of image gradient and background colors. Full compatibility with the the new Bullet Design ~ Ultimate module. 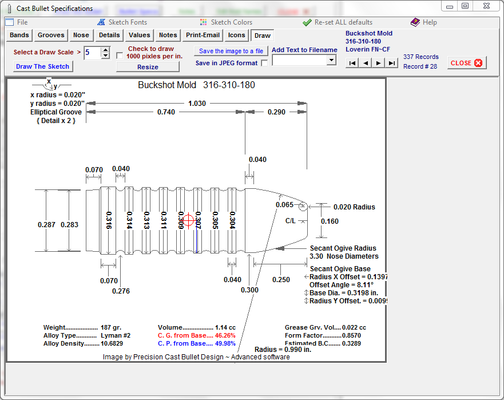 the computer calculates bullet dimensions according to proscribed parameters. and Bullet images to evaluate a precise match to the chamber, cartridge and bullet combination.